This entry was posted on Friday, August 5th, 2011 at 23:45 and is filed under Economics, Media, Politics. It’s amazing. You can turn on your television any time of day, and somewhere, on some channel, it’s a virtual certainty that you can find leftist propagandists hard at work. They smear people, they pitch radical ideas, and they try very hard to re-package their unrealistic theories and policy ideas so that you will swallow them. While nothing is particularly new about the method, what is new is that cable and satellite television have created so much otherwise empty air-time that this sort of person has rushed to fill the vacuum, and since they’re generally controversial, most liberal networks are only too happy to accommodate them. It becomes a reason for concern when you see the same thing being done on allegedly “right-wing” Fox News. On tonight’s renewal of “The O’Reilly Factor,” with Juan Williams sitting in, viewers had an opportunity to see one such professional lay it all out there on behalf of leftist ideology. 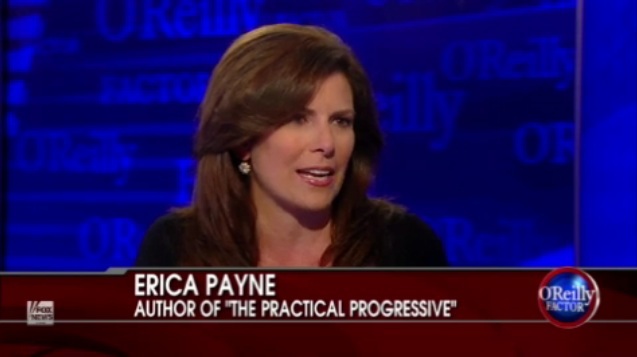 Erica Payne of the Agenda Project and Stephen Moore of the Wall Street Journal were the guests during the “Impact Segment.” Ms. Payne is precisely the sort of economic propagandist about which I’ve been warning you. Her appearance was aimed at setting the stage for an outrageous notion: In her view, we should raise unemployment payments in order to stimulate the economy. Her theory is that by doing so, demand will be sparked, and this will in turn spark business and increase activity thereby bolstering job creation. She couldn’t be more wrong. Her assumption rests on the infantile economic theory that demand drives supplies, but in truth, it does no such thing. By contrast, supply-side policies, when fully and properly employed, have been shown to do what it is that she claims is her object: The creation of jobs. I expect her thesis will seem superficially sound to many, but even a few moments alone in study with this theory should be sufficient for most reasonable people to debunk it. Demand-based economics of the sort Ms. Payne advocates cannot work, because as a truism of any free market, and in the strict application of classical economic terminology, one cannot demand that which does not exist. Absent a supply, the desire for a thing is not a demand, but a wish. This technical point has a broader application than the dumbed-down economics in most undergraduate level curricula will ever teach their students. In the main, this is because their professors are of the exact sort who very likely [mis]educated Ms. Payne. They aren’t economists in the strict sense, so much as they are propagandists. In economics, demand is demonstrated by the presentment of payment, or promise of payment, in exchange for goods or services. It is not represented by the unlimited, unpaid, aggregate wishes of all mankind. That a thing is desired by many doesn’t constitute demand. That a thing is desired by any who show up to purchase it from an existing or imminent supply, does. One could stop at this point and simply submit that Ms. Payne’s understanding of economics is inferior, but from here, the point must be fully explored to complete the picture with respect to what Ms. Payne is good at doing. Her Keynesian argument fails miserably when you ask the question: “How will consumers demand things that do not exist?” Producers of the supplies upon which our economy relies do not manufacture goods to meet the demands of people who have not the money or more frequently, the credit to buy them. Even if an unemployed person’s stipend from the government were to increase by 25 or even 100%, still that person cannot reliably get credit to buy a car or a home or much of significance, or pay a contractor for home improvements with the loans for which they will still never qualify, due precisely to their state of unemployment. No producer on Earth could long survive in this manner, producing endlessly to fulfill wishes, and the proof is what has happened to our housing industry. In that case, the government actually coerced lenders to accept a lower threshold of qualification. I needn’t explain at length how well that has worked. Like all thorough-going Marxists, Ms. Payne isn’t interested in that. In the end, her argument comes down to an emotional, pseudo-humanitarian plea, as she tried to defame Steve Moore for caring nothing about the unemployed. In truth, what Mr. Moore was expressing was an honest concern for we taxpayers who will ultimately foot the bill for this latest experiment in redistribution of wealth. As usual, however, the leftist propaganda mills never cease to ignore or reverse the law of cause and effect. Imagine a world in which cause and effect operate as Ms. Payne imagines. In her view, providing you the same income as if you were actually employed will substitute perfectly as though you were, but as detailed above, no creditor on the planet would fall for this scheme. What creditors consider isn’t income alone, but as you’re well aware, work history, length of employment, and general stability on which to base a best guess that the applicant will make timely repayment. To Ms. Payne, if only the person in question would have the cash, they could behave in the market precisely as though they were actually employed. To the extent that they are buying groceries or other consumables, or low-priced merchandise, or paying utility bills, it is somewhat true, but none of that offers a significant boon to the economy. We know, in fact, that the items that add sufficient value to the economy to create more jobs with higher wages are durable goods, and homes, and similar items of longer-term investment. No reputable lender on the planet would finance such things for unemployed people. Ms. Payne has handily accomplished what leftist theoreticians so frequently do: She’s convinced her audience to believe that the money, an effect, can stand in place of the cause, which is a reliably-employed person of stability and credit-worthiness, all without mentioning the subject. This tendency to fake one’s way through reality characterizes the entirety of leftist economic dogma. She is able to make such arguments to audiences with some success because the full ramifications of her statement are never considered in detail by most viewers. We tend to think in terms of the short-run effects of an infusion of cash and how it might affect us, but we seldom stop to consider what it would really accomplish in terms of sustained, job-creating commerce. This is because Ms. Payne is a propagandist who specializes in “spin” which is a kinder, gentler way of saying “lies.” I have warned my readers of propagandists disguised as economics experts, and it took no longer than twenty-four hours since my most recent reprise of that theme for there to appear a perfect example, front and center, which many readers may have seen. In short, she’s intent upon creating salable leftist policy ideas, with the emphasis on selling them. As I said, many will now attempt to propagandize you with leftist economic theories, but none of them will base their proposals on sound economics. They are the professional class of propagandists, and while you may not have known Ms. Payne before tonight’s episode of The Factor, she was presented on equal, expert footing with Stephen Moore, a long-studied and professional economist who knows something more substantial about the field, and its history, while providing an apt accounting of actual economic theory and its practice. The very notion that Ms. Payne deserves the sort of expertise her appearance on par with Mr. Moore would imply to the casual viewer is a travesty, and is one more reason why the discerning viewer should trust no news sources without some form of independent research or review. One must begin to question the editorial motives of the producer who would permit such an advocate of rampant statism to shout down a professional like Mr. Moore. It’s absurd to suggest it could have been accidental. I don't watch BillO. I saw a radical change in him right after his first White House visit with Obama. Beware of going to see Obama at the White House. Brain snatchers lerk there. Well, probably not, but it seems like it. Bill completely lost his mind at roughly the time Beck left Fox. Up until then, I think he was hanging on by a thread. This is a great piece you've written that applies directly to an ongoing debate I've recently had to cut off with a friend who buys into every ounce of the Keynesian garbage without question. Some people just refuse to see reason when the "humanitarian" arguments are flouted, though even those hold no real water when examined more thoroughly….